This document gathers metadata proposed within the MultilingualWeb-LT Working Group for the Internationalization Tag Set Version 2.0 (ITS 2.0). The metadata targets web content (mainly HTML5) and deep Web content, for example content stored in a content management system (CMS) or XML files from which HTML pages are generated, that facilitates its interaction with multilingual technologies and localization processes. This document gathers metadata proposed within the MultilingualWeb-LT Working Group for the Internationalization Tag Set Version 2.0 (ITS 2.0). The metadata is used to annotate web content (referred to henceforth just as content) to facilitates its interaction with multilingual technologies and localization processes with the aim of publishing that content on the Web in multiple languages. In this context, content can refer to static web content in HTML or XHTML, deep web content, for example content stored in a content management system (CMS) or XML files from which HTML or XHTML pages are generated. Since a lot of the terminology is not known across communities, this document contains a glossary of terms. Following the terminology introduced in the Internationalization Tag Set (ITS) 1.0 specification, ITS 2.0 metadata items are called data categories. Data categories are defined conceptually (e.g. Translate). In ITS 1.0, they are implemented in XML, see the implementation for Translate. ITS 2.0 will provide additional definitions and offer implementations at least for HTML5. To lower burden on implementors and to foster adoption, the data categories are proposed as in independent items. See the section on support of ITS 1.0 data categories for more details. The MultilingualWeb-LT working group currently plans the following implementation approach. Conceptual, prose definitions of data categories will be given as in the ITS 1.0 specification. The implementation for HTML5 will rely on lower cased, custom attributes in HTML5 prefixed with its-, eg. : <p its-locnote="...">...</p> (Note that the prefix its- itself might still change). This approach is taken from the extensibility section of the HTML5 specification. In addition, the working group will provide an algorithm to convert its- attributes into RDFa and Microdata markup, to serve the needs of the Semantic Web community and of search engine optimization. The conversion to RDFa will add URIs to each metadata item in an HTML5 document. This is needed as reference points for the metadata items after extraction of RDF. In XML, the its- prefixed attributes will have a counterpart in a dedicated namespace. The ITS namespace http://www.w3.org/2005/11/its/ is under consideration. Please send feedback to the public-multilingualweb-lt-comments list (archive). Feasibility of the metadata approach and the implementation approach described above. Who is willing to implement a given data category in applications? What data categories can be merged with other data categories in the list? What data categories need to be defined more clearly? What usage scenarios and existing or to be created implementations are important for specific data categories? What types of content is in need of these data categories: HTML, XML, CMS configuration files, XLIFF, etc. The working group will gather feedback until end of June 2012. This feedback will be the basis for creating the first draft of the data category standard definition. After June 2012, this document (the "requirements document") will not be updated anymore. Requirements are used to define the set of data categories to be addressed in the standard definition which is due for a feature freeze November 2012. The WG has closed the open gathering of requirements by the end of April 2012, and has performed an initial round of consolidation for a working draft of the requirements document to be published for 20th May. The WG will continue a process of requirements consolidation, such that a prioritised and consistent set of data category requirements is available by the end of June 2012. A major milestone in this process will be an open requirements workshop to be conducted in Dublin 12-13 June. A public consultation questionnaire has been executed, resulting in 17 responses. A summary of results has been produced that assesses responses against current state of requirements. A requirements assessment conducted 4th May 2012, and is now being supplemented with implementation commitments. This will guide the prioritisation of work on the different data categories. Refers to the language in which content is originally authored. Content is a source language is sometime referred to as source content. Refers to the language into which source content is translated. An organisation offering commercial translation and localisation services. A specific target market with known language, cultural and other requirements for the publication of content. An organisation making use of the services of an LSP to convert content from a form suitable for one locale to a form suitable for one or more other locales. In the context of localisation processes, sometime referred to just as the 'client'. Used by content authors to generate source language content and associated internationalisation mark-up. This class includes: tools for authoring static HTML/XHTML; authoring tools integrated into CMS and authoring tools producing XML files that are converted by CMS or XML stylesheet transforms into HTML/XHTML documents. Used to assess the conformance of source content to style, controlled language, terminology and internationalisation guidelines. Used to manage multiple content files or content components from authorship to publication, including version control and archiving. Manages the localisation workflow process, collecting and distributing source and target content and associated language resources such as translation memories, term bases, context information and translation guidelines. Used by translators to improve productivity of content translation and translation post-editing. May include features such as TM match, terminology/glossary lookup, machine translation, concordancing, access to external reference and context material and in-context (WISYWIG) preview/editing. Used for checking and reporting the quality of translations in relation to translation guidelines. Online services that is used to automatically transform source language content into target language content. Online services used to automatically generate annotations to specific pieces of content based on automated analysis of their lexical and semantic properties. Applications that render HTML and XHTML documents for users. Working for the content generating organisation, this person is responsible for identifying terminology in the source content, cataloguing it so that it can receive consistent treatments and ensuring consistent translations are available in required target languages. Manages content localisation, either by passing content to be localised to an LSP or by invoking translation services directly on content held on the client's systems. Typically an employee of the organisation that owns the content. A translator who translates or post-edits suggested MT or TM translations text segments or terms presented via a specialised interface to a client's systems. Could be a professional translator or a volunteer working on a crowd-sourced translation project. A bi-lingual person who provides a quality assessment of translated text, presented via a specialised interface to the client's system, at granularities from individual terms or segments up to a set of documents. Could be a professional reviewer or a volunteer working on a crowd-sourced translation project. A manager responsible for: the extraction of text to be translated from the client's systems; its preparation for translation; its machine translation and/or TM-matching; the packaging of provisional translation, source, source context and any relevant TMs or term-bases; the distribution of packages to translators; the monitoring of translation/postediting progress; and the collection of completed translation for return to client. A manager responsible for: the extraction of translated text from a CMS; its the packaging of translation, source, source context and any relevant TMs or term-bases; the distribution of packages to reviewers; the monitoring of review progress; and the collection of completed completed reviews and the assembly of a report for the client. A professional translator who directly translates or post-edits suggested MT or TM translations of text segments or terms presented via a CAT tool. A professional linguist(?) who provides a quality assessment of translated text, presented via a CAT tool, at granularities from individual terms or segments up to a set of documents. The developer and operator of software systems that provide an MT service. Typically responsible for the ongoing reconfiguration/retraining of the service. The developer and operator of software systems that provide an TA service. Typically responsible for the ongoing reconfiguration/retraining of the service. The developer of CMS platform software. The developer of software systems that support translation and postediting, multilingual terminology management, translation review and localisation workflow management. A software developer contracted to develop plugins or connectors that interface two or more software systems sources from separate third parties. An automated agent that crawls multilingual web pages in order to index them for search engine providers. ITS 2.0 will support several business scenarios around the production of multilingual web content and the operation of localisation processes over web content. The following use case description serve as a broad orientation. Some use cases are linked to proposed data categories. More links will be created in a subsequent version of this document or in the to be published ITS 2.0 draft. Content authors can add internationalization meta-data to documents or document fragments that they are authoring. This metadata helps to ensure that content is translated correctly and in way that is appropriate to its intended use. It can also ensure that content is not translated unnecessarily, that certain terms are translated in a prescribed way and that special care is taken in translating specific content. Communicating this via meta-data reduces downstream content processing costs, reduces the likelihood of translation errors and improves the assurance of quality of translations. In all these cases, metadata items may be added, either automatically or manually by the content creator using content authoring tools. Since authoring is a central process for ITS 2.0 data categories, the following list only provides a broad overview. This use case elaborates on the mention of automatic meta data annotation Content Authoring use case description. The automation of meta-data annotation reduces the manual cost of annotation and may increase the accuracy, consistency and comprehensiveness of such annotations. The enrichment of source content with named entity annotations is one example of such an automatic process. To realize this use case, tooling is already available and will be tailored by working group participants. One main tool in this respect is the Enrycher tool. Enrycher adds metadata for semantic and contextual information. Using named entity extraction and disambiguation can provide links from literal terms to concrete concepts, even in ambiguous circumstances. These links to concepts can be used to indicate whether a particular fragment of text represents a term, whether it is of a particular type, and alternative terms that can be used for that concept in other languages. Concretely, Enrycher uses DBPedia to serve as a multilingual knowledge base in order to map concepts to terms in foreign languages. Given that it also outputs the type of the term even if the exact term is not known, it can still serve as input to translation rules that apply to specific term types (personal names, locations, etc.). The annotation procedure with Enrycher is implemented as an additive enrichment of HTML5 markup. The client sends content (defined by client-based localization manager) to the LSP or indicates that content available on the client's systems is ready to be localised. The LSP obtains the content and localises it. The localized content is re-integrated into the client's systems. This process should also be triggered by the client-based localization manager (and not be ‘injected’ by the LSP), typically subject to some QA review conducted by the client, the translating LSP or a third party LSP. In this scenario, metadata such a content identifier specifying the position of translated content to be re-integration into the broader content document structures needs to be provided. Specialised file formats that contain the same content in multiple languages are often used for exchanging source and target content between systems such as CMS, TMS and CAT tools, that participate localisation processes. An important international standard in this regard is the OASIS XML Localisation Interchange File Format (XLIFF). The conversion of content format to XLIFF and back again, so-called XLIFF roundtripping is an important class of implementations for this use case. The accurate automated conversion of content files to multilingual localization file formats reduces file handling costs associated with file handling and reduces any associated errors or loss of content. It must however maintain the binding of certain meta-data to both source and target content. QA metadata can be applied to either content documents or sub-document fragments (for example, some portions of a document may have been previously proofread and it is useful to know which parts need attention and which do not). These metadata support the systematic review of a document to identify any linguistic errors (e.g., mistranslations, typographic errors, text inappropriate left untranslated, grammatical errors, stylistic errors). This can help ensure QA consistency when more than one individual is involved in provision and assessment of translation (i.e., situations other than self-assessment), where information about the translation process is needed. For example, an LSP may provide a translation, which gets sent to another LSP for review (and optionally returned to the first vendor for correction). The translator uses the translate data category, related information and definitions during translation to improve the quality and accuracy of the translation and to ensure only the required content is translated (reducing wasteage of translation effort). The translator may add metadata to signify the content that was human translated. 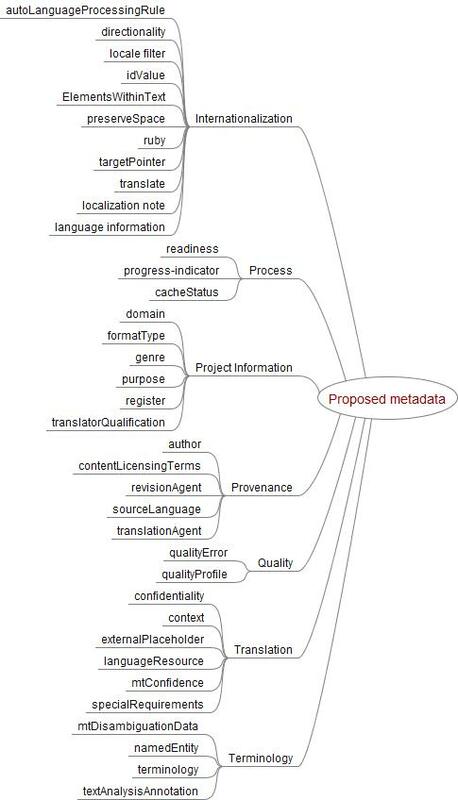 A lot of metadata is relevant for translation. The following is only a small subset. Pre-QA means that this metadata is relevant before a quality assurance step has taken place. The way in which content has been translated is often important. It is often necessary to distinguish between content that has been human translated, machine translated or results from human post-editing of machine translation. Client localisation managers may want to be assured that received target translation has been subjected to some human checking or postediting if that had been the contracted requirement. MT creators are unable to effectively discern human authored, full high quality translation content from non-reviewed automatically generated noise. They need to be able to control the MT training sets based on information describing the quality and which process has been used to create it. After a quality assurance process, translator fix errors and signify that all content has been re-verified. After the POST-QA process, the content is reintegrated into the original source, e.g. a CMS, an XML file or other types of content. For revision after the localization process, information about the time of translation and last revisions is useful. With this information, it can be decided whether the content should be published or whether a reversion to previous versions is necessary. Content managers shall be able to identify unsatisfactory content to be transmitted back to the LSP. Interoperable, when the RTTS gives back the translation in real time and the client server published the content in the web by their means. Publishing, when the RTTS takes the source content already published by the client in the web and performs the translation and the publishing, both in real time. Both approaches need metadata to be used in the synchronous machine translation phase, the synchronous automatic publishing phase and the asynchronous post-editing or terminological tasks for quality machine translation improvements. The following figure provides a broad overview of the proposed data categories. The table below lists proposed metadata elements with a brief description and statement about which level(s) they apply to (document = applies to the entire document, element = applies to defined elements in the document, span = applies to user/tool-defined spans). Links go to more detailed information below. For a table showing which data categories are needed by which work packages, see this document. In this document, language is identified via BCP 47 language tags. Implementations of ITS 2.0 are not expected to process the "u" extension for further locale information as defined in RFC 6067. An example language tag is de-de. An example locale is de_de. Both language tags and locale identifiers are case insensitive and are written in lower case throughout this document. These categories relate primarily to the internationalization of content and are generated prior to translation (and may be consumed in translation). Includes any items that build on existing ITS functionality. Indicates how the span should be treated during automatic translation. This features goes beyond the translate category to provide instruction for cases where text should be transliterated rather than translated. COMMENT: this proposed data category might be changed to be specific to the process of Transliteration - feedback is welcome on this proposal. HTML5 brings new features to directionality. The ITS 1.0 feature should be updated to reflect the changes. localise a Swiss legal notice only in "de_ch;fr_ch;it_ch"
Using identifiers with content is a very common activity in localization and follows the best practices for internationalization (See http://www.w3.org/TR/xml-i18n-bp/#DevUniqueID). For example unique IDs can be used to leverage the same translation from one version of the document to another, or to align content between two versions. The XML attribute xml:id is the standard way of representing an identifier in ITS 1.0 (See http://www.w3.org/TR/xml-i18n-bp/#AuthUniqueID. However, in some case the document may be using other attributes, and could be in non XML formats. Such ID value must be persistent from one version of the content to the next, and, ideally, it should be globally unique. If it cannot be globally unique it should be unique value at the document level. Ideally the mechanism should allow to build 'complex' values based on different parts of the document (e.g. attributes element or event hard-coded text. For example, in the XML document below, the two elements <text> and <desc> are translatable, but they have only one corresponding identifier, the name attribute in their parent element. To make sure you have a unique identifier for both the content of <text> and the content of <desc>, you can combine the value of the parent's id with the elements' name to obtain the values "id1_text" and "id1_desc" for the <text> and <desc> element respectively. (See Example A below). Such an ID value would also enable a number of other data categories either through rule references or through external reference to the span from stand off meta-data. A similar approach was taken in xml:tm. Such id value would be mapped to the XLIFF 'resname' attribute. XLIFF makes a distinction between 'id' and 'resname'. IDs are tool-specific and, while they can be the same as the 'resname', they do not necessarily persistent across different version of the document, or can even differ depending on the extraction options used on the same document. ITS2.0 should support the elements within text data category from ITS1.0 and should consider the following extension for local elements within text. There is no local rule for the "Element Within Text" data category. Having a local rule would allow ITS processor without XPath support to still identify element nested or within text from other elements. See the definition for the Elements Within Text data category in ITS 1.0. That definition was only implemented as a global rule in ITS 1.0. Knowing whether the white spaces in a given element (especially the line-breaks) are collapsible or not is important for proper segmentation and matching when using computer assisted translation tools. Text formatted for reasons not related to the final presentation of the document. For example a paragraph "pretty-printed" (See Example A below). Text where white spaces are meaningful. For example, where line-breaks can be segment-breaks and/or spaces is the only way to format the final output (See Example B below). It is important for translation tools to make a difference between those two cases (text can be collapsed safely) and the last two (text should not be collapsed). The indication of whether white spaces should be preserved or not should be accessible from the document itself, as defining the information at the rendering level (e.g. in a CSS style-sheet) may not be accessible for the translation tool. The xml:space="preserve" attribute may provide a solution for some of these requirements at the document instance level. The xml:space attributes defines only "preserve" and "default", "default" not being necessarily "do-not-preserve", but means "do-whatever-you-want". Do we have situations where "do-not-preserve" would be needed? The whiteSpace constraint defined in the XML Schema Part 2 (http://www.w3.org/TR/xmlschema-2/#rf-whiteSpace) may provide a solution for these requirements at the schema level. The white-space property in CSS2 (http://www.w3.org/TR/CSS2/text.html#white-space-prop) defines a more complex set of values than xml:space. Are they needed? The ITS 1.0 ruby model is based on the XHTML ruby specification. ITS 2.0 will update the ruby model to refer to HTML5. The related discussion is ongoing in the I18N Core working group. Various proprietary file formats (e.g. software resources, localization formats) store two or more language versions of the same text. Such format cannot be processed easily with a traditional XML filter because there is currently no way in ITS 1.0 to indicate where the target text for a given source is. (See Example A and B). Possibly an XPath expression that selects the node where the target is located relatively the location of its corresponding source. (See Example C). This addresses only cases for a single target. Already implemented in html5 and in ITS 1.0 for XML content. ITS 2.0 will define how to apply this to CMS or other types of content. These categories are used primarily for controlling or indicating the state of the content production process. COMMENT: The naming convention used here is inconsistent: some of the categories use "Status" and others "State". We should be consistent. ITS2.0 should be able to indicate the readiness of an element for submission to different processes or provide an estimate of when and element will be ready for a particular process. ITS2.0 should be able to indicate the relative priority elements should be subjected to when submitted to a process. ITS2.0 should be able to indicate an expectation of when an a specific process should be completed for an element. ITS2.0 should be able to specify if an element previously submitted to a process has subsequently been revised and therefore needs to be re-submitted to that process. (high|low) - should we should keep this simple? pivotLang - value: standard ISO value. Indicates the intermediate language in the case is needed. Two examples: 1) Going from a source language to two language variants (eg. into Brazil and Portugal Portuguese), it is more cost-effective to go to one first (being this first variant a "pivot" language) and to revise later to the second variant; Going from one language to another via an intermediate language (eg. from Maltese into English and from English into Irish, because there is not direct Maltese into Irish available translation). COMMENT: There seems to be a not insignificant overlap with ISO/TS 11669 in this case. For the sake of consistency we should try to consolidate with that standard where possible. Provides an indication of the status of the source and target(s) texts in a system cache for use by real-time translation, TMS, etc. to determine when retranslation is needed. A timestamp can be used to determine when the content was cached. COMMENT: I would suggest for the date and time that we use one of the following. I believe the first is better as it is more easily readable for humans and is ISO standards-based. The Unix time stamp (e.g., "1333605600" = April 5, 2012 at 06:00:00 UTC). These categories provide information about the project that may be useful for controlling processes, but they do not convey or control process state themselves. It needs to be decided what ontology of domains to be used. COMMENT: should this be just a pointer to a concept node in an ontology, accompanied by a pointer to the ontology? This would need some conformance statement on the form of the ontology, but Semantic web ontologies naturally support this. COMMENT: A standard list of values has been suggested, but this seems hard to achieve. COMMENT: There might be a need to support multiple domains. For example, a text about the history of Russian legal reforms will have domain-specific content from at least two domains (history, legal) that cannot be united into a single hierarchy. We need to think about the structure to support this. COMMENT: There is no scholarly agreement on register divisions. The listing above is somewhat accepted for English, but would not always work for other languages. Impossibly to enumerate all possible values. Primarily useful for human decision making processes. These categories provide a record of the origin of information and the agents that have acted on it. COMMENT: Is this equivalent to dc:author? MT creator should be aware not only of process and quality metadata but also about a legal provenance metadata. This would use RDF license linking mechanism. The aim is to provide machine readable information about content licensing terms and their implementation in MT related processes. In reference implementations, business rules should be defined to automatically include or not include data in training corpora, based on provided licensing information. Needs information on the action of the revisor as well, e.g., the degree of postediting: light, moderate, full. COMMENT: Do we want to allow more granularity, e.g., some way to say "this was translated by Bing Translator v. 1.0.2" or "translated using SDL Trados Studio 2011"? If we do this, we make it harder to process the values. If we stick with the type values, we simplify decisions about how to trust the results. These categories are used for explicit quality assurance steps undertaken on content (source or target). Note that the content of this element may be a span or may be empty in the case where an error does not enclose a span of content (e.g., something is missing in the content). ruleSet? (text) the rule set referred to. If this parameter is used, the value should correspond to a rule declared in a ruleSetName attribute in the qualityProfile metadata category. severity? (text) the severity assigned to the error, if the QA profile uses severity. Note that the content of this attribute is native to the particular QA system and is not normalized. The <span its-qa-type="syntactic error" its-qa-ruleSet="SAE J2450" its-qa-severity="major" its-qa-note="bad grammar" its-qa-agent="ABCReview">verbs agrees</span> with the subject. While any established metric may be used (or none at all if the "type" and "ruleSet" attributes are omitted), the default is to use the LISA QA Model, which seems to have the most general currency in the translation and localization industry, and other metrics should be declared in the qualityProfile data category. In principle, this can be used without any attributes at all as a pure marker, e.g., The <qualityError>verbs agrees</qualityError> with the subject.. However, inclusion of the attributes makes this data category more useful for real actions. COMMENT: Should we look at having a catalog of recognized rule sets that could be declared in this element without the need for the qualityProfile as a separate metadata element? That would promote data portability since individual pieces of content could be copied without an external reference? Then the dependency on qualityProfile would exist only if the user wants to declare a profile that is not in the catalog. COMMENT: I combined the previous score and weight items into severity. Since this applies to single errors, the score is by definition 1, but the severity is variable. The earlier formulation confused score and severity. COMMENT: If [severity] should be a number then it definitively should be an integer. With floats you will have to deal with rounding errors. name? (text) The name used to refer to this rule set in the document. If undefined the value of "LISA QA Model" is assumed. uri? The URI where the rule set can be found (if available). score? The score or error count (whichever is appropriate) returned by the QA rule. agent? text description of the part responsible for supplying the score/pass. (This example assumes that the data category is declared as a meta element, but I'm sure there are better ways to handle this. At least one of the attributes must be used (otherwise the data category is empty). COMMENT: Can be used without qualityError where this presents a summary of QA activities that are not tagged (e.g., when a reviewer uses the LISA QA Model software, which does not permit local tagging of errors). "agent" is defined in both this and qualityError. When declared here, agent is global in scope to indicate who did an assessment; when declared locally, it applies only to the local scope and overrides a global declaration. Any more complex confidentiality requirements (e.g., a statement that something is top-secret, community, corporate, etc.) would be handled by separate negotiation between the parties and are not covered here. A location in a document, computer file, or other information medium, where the term frequently occurs, such as a user interface object (in software), a packaging element, a component in an industrial process, and so forth. The element content shall be expressed in plainText, and preferably be restricted to a set of picklist values. The following picklist values are recommended for software user interface locations in a Windows environment. COMMENT: suggestion that we use MIME-types for format declaration, declaring private types if needed. COMMENT: there are not public MIME-type declarations for many common formats and we might need to allow "other" as an option. COMMENT: the issue of format needs to be resolved. I personally like the idea of MIME types if they work. Data Categories related to the association of content with terminological data. concept reference: points to a concept in an ontology that this fragment of text represents. May be an URI or an XPath pointer. alternative labels: expressions of that concept in other languages. Text analysis should depend solely on the source language, independent of the target languages. The component must provide additive markup, preserving the original structure of the document. COMMENT: should keep relevant standards (e.g., ITS 1.0 term data category, TBX, OLIF) in mind. This data category allows the results of text analysis to be annotated in content. Annotation agent - which tool produced the annotation. Confidence score - what is the system's confidence for this annotation, on the range of [0.0, 1.0]. It will adopt the use of data categories to define discrete units of functionality. It will adopt the conformance principle of ITS1.0 that an implementation only needs to implement one data category to claim conformance to the successor of ITS 1.0. All solutions proposed should be designed to have as little impact as possible on the tree structure of the original document and on the content models in the original schema. For the implementation approach envisaged, this means that its-* attributes would be converted in XLIFF to the relevant namespace, e.g. its-term in HTML5 to its:term. ITS2.0 should support an explicit expression of the process model to which ITS2.0 conformant content can be subjected. A references section will be provided in a future version of this document. This document has been created by participants of the MultilingualWeb-LT Working Group.